Planning is not optional, unless profits are optional. Gaining better understanding and management of job costs. This is part 1 of a series of commentaries that are intended to stir up ideas for the high-tech contractor. They consist of excerpts from “PLUG” or the “Plan Users Guide”, a practical catalyst intended to promote positive change in the automation contractor ‘s world. The complete series will be made available upon request after all modules have been published in AutomatedBuildings.com. 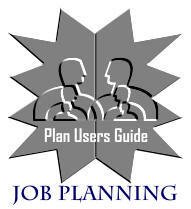 Job Planning is not popular. It can be a time consuming, frustration filled, never ending activity – and that’s on a good day. But on a bad day, people may regret not having done the work because they lack the benefits that planning gives them. The fact is that planning is not optional unless profits are optional. Industry specific comments related to "Control" and "Supervision"
In analyzing our needs and efforts to control the costs on our projects, the following observations are made. We are in an industry where workers tend to be involved in the simultaneous performance of multiple contracts. This has implications regarding the degree of Supervision and help that can be given on an on-going basis. It is NOT practical to guide our people minute-by-minute. Hence, self-discipline, a genuine desire to perform in a team setting, and the ability to work with minimum supervision are crucial for the success of our people, perhaps more so than in other environments. Many automation installations consist of fragmented bits of work, not easily 'programmed' via a super-sophisticated ‘project management' system, due to the large quantity of tasks to be measured. This tends to make the traditional 'project management' mathematics cumbersome, and of diminishing-return value when applied to the (typically large number of) small, fragmented, non-contiguous work segments. Planning can be a pretty boring, frustrating, and even useless task if the wrong approach is taken. To become otherwise, we must get it straight in our mind that planning is NOT an 'event': PLANNING IS AN ATTITUDE, A FRAME OF MIND, A PROCESS. A prime attribute of a good planner is the ability to foresee an end result acceptable to the parties involved. The following paragraphs discuss some of the basic principles that should be employed when planning our jobs. In planning, you start from the end, and work your way toward the beginning. With that we mean that to put a successful plan together, we must KNOW WHERE WE'RE GOING. And remember, the Estimate and detailed Design have established WHERE we're going; the PLAN shows us HOW to get there. For our job plans, that means that our plan will consist of a series of steps and actions which will get us to the 'end': to complete the installation on time, and within the estimate or budget. I don't have time to plan; I have real work to do! Planning IS real work; it is a productive process. It may in fact be the MOST productive of all tasks on a project since it can PREVENT us from going in the wrong direction, and having to un-do, then re-do tasks or installations, etc. The single most important function of a project manager is the planning function, as it affects all other aspects of the work. This is a good way to ensure that the progress toward the goal is measurable. Lack of measurability translates into lack of a real plan. MILESTONES are the guarantee that we'll know if a plan segment has been completed as planned: it's either done, or it isn't. To illustrate, an example of an EVENT or MILESTONE is: "The submittal drawings have been approved". An example of an ACTIVITY would be: "Preparing the drawings for submittal to the consultant". Effective planning will re-focus us from ACTIVITIES to RESULTS. the scope of the performance is predetermined and measurable. the achieved performance is measured against the expected, communicated, and reasonable standard. If the 'message' to the performing trades was: "The job must be done by December 15. ", then the task must be measured in terms of whether or not the deadline was met. If the deadline WAS met, and we reprimand the workers because "too much money was spent", we are guilty of setting the wrong standards. Planning makes the old adage come true: 'You get out of it what you put into it." Sloppy (or NO) planning will lead to haphazard results. A good plan will give good results. A good plan even on a job that was badly estimated will greatly improve the job's chances for (relative?) success. In nutrition: “You are what you eat". In business: “You become what you plan." Relevant approximations are better than meaningless Super-detail! A plan deals with the future. In reality, nobody can predict the future accurately. Technically speaking, every plan is therefore doomed to be wrong or inaccurate. This illustrates the concept that the focus of planning is NOT on trying to accurately predict 'to 2 decimal places' what the job's outcome will be. Planning is done to allow us to provide a means to guide our decisions, and to increase the PROBABILITY of successful job outcome. In a nutshell, to influence the outcome of the job so that it more closely resembles what we want. That we want to measure results against a predetermined plan is fundamental to the planning process. If the plan itself, or the way we go about executing the plan, makes this evaluation impossible, then the planning process suffers, and so will the job results. This is often a tricky task. Measurement becomes difficult when we allow our activities to be divided into little spurts of action in a confused manner, and when work is done in many areas at the same time. We have discussed the various aspects of planning; and why planning is a necessary and productive activity. Hopefully, it has become clear that job planning is not optional for your people who are in charge of projects. However, the whole team (management, sales and operations) must support the planning process to ensure its success. In the next article, we will explore "Successful project control system and Project Cost Introduction".